As part of the 2015 POPSUGAR Insights Food study, we surveyed female visitors to POPSUGAR to better understand their grocery-shopping behavior and consumption of digital food content. With 93% of women heading online for inspiration, we were interested in learning the specific types of food content they love the most. We worked with our POPSUGAR Food editorial team to identify the specific types of content we offer and asked women to tell us their favorites. 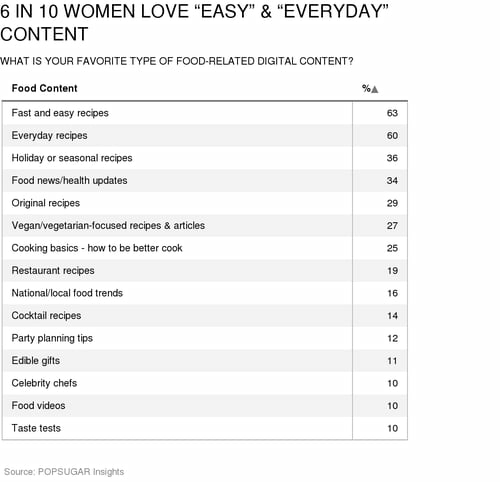 Overall, women are most passionate about "fast and easy" (63%) and "everyday" (60%) recipes. Holiday or seasonal recipes ranked third overall (36%), followed by "food news or healthy updates" (34%). One quarter of women love to improve their cooking skills by choosing "cooking basics" content, and despite what dominates TV these days, only 10% of women we surveyed are interested in "celebrity chef" content.